Heat olive oil in a large skillet over medium-high heat. Add onions and peppers; saute 5 minutes or until tender. Add garlic; saute 1 minute. Add shrimp to pan, sprinkle with Cajun seasoning and paprika and cook 3 to 5 minutes. Add 1/4 cup water and remove from heat; add butter, stirring to melt. Cover and keep warm. Bring cream, salt, 2 cups water, and chicken bouillon cube to a boil over medium-high heat. Reduce heat. Gradually add grits, and cook for 5 minutes, or until thick and bubbly, stirring constantly with a whisk. Remove grits from heat; add cheese, and whisk to combine. 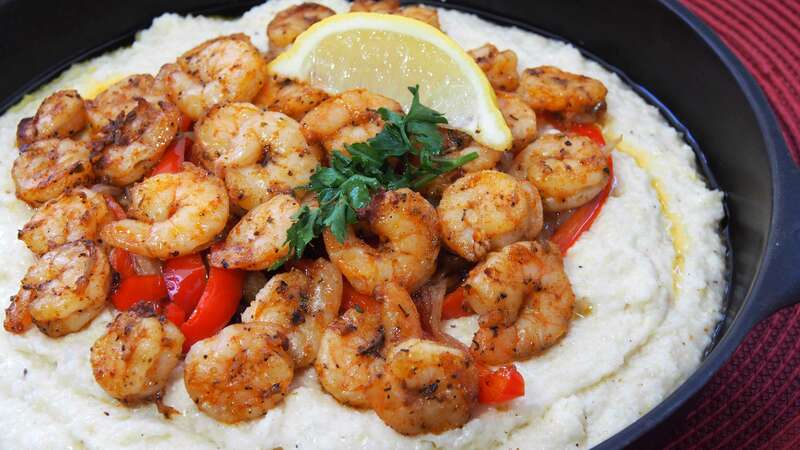 Spoon shrimp over grits, garnish with parsley and serve with lemon wedges.